Arachnophobia is one of the top 10 most common fears and, unfortunately, for those who suffer from it, spiders are everywhere. However, even though they can be rather creepy, it doesn't mean you necessarily have anything to fear. Of course, no matter where you live, whether in the midwestern United States or somewhere else, you might have something to fear. How do you know, exactly? Know the different types of spiders.All spiders have eight legs, six or eight eyes, no wings and fangs. However, there are two types of spiders, divided by the method they use to catch their prey. Hunting spiders rely on their eyesight and speed to catch their prey while web-building spiders spin a strong silk into a web to catch their prey. In the mid-west, there are six main types of hunting spiders and three types of web-building spiders. Learn about hunting spiders native to the mid-west.The six hunting spiders native to the mid-west are jumping spiders, wolf spiders, fishing spiders, sac spiders, crab spiders and parson spiders. 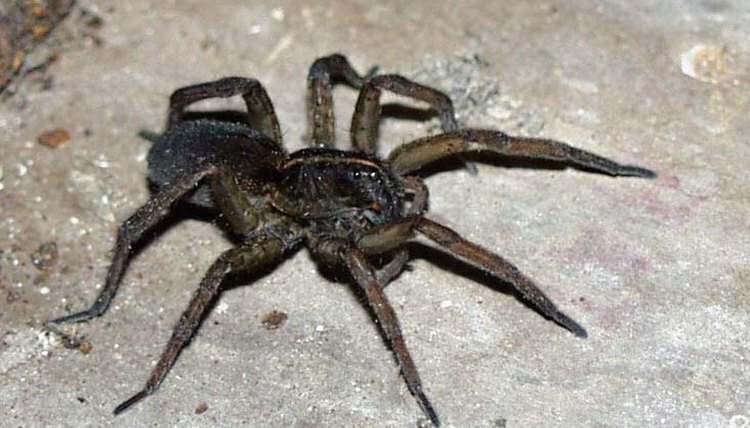 Sac spiders, wolf spiders and jumping spiders can be found but indoors and outdoors. Although these are hunting spiders, they may also have silk strings attached to them to aid them in case they fall or if they need help with other small tasks. Familiarize yourself with web-building spiders.The three web-building spiders native to the mid-west are the common house spider, orb spiders and grass spiders. Know how to determine which spiders pose a threat.Of the seven spiders common to the mid-west, very few are poisonous or pose any type of threat to humans. Although most spiders do have some form of venom, few can open their mouths wide enough for it to matter. Of those that can, the bites can cause swelling and itching and, if it's a bad bite or the person is exceptionally allergic, they can cause headaches, fevers, nausea and/or vomiting. Jumping spiders can cause a problem to humans, but the symptoms will go away after a few days, and the same is true for wolf spiders and parson spiders. Common sac spiders, on the other hand, are slightly more dangerous and can leave marks and open wounds which may flare up and leave a bump or may simply leave small sores that need to heal.